Though consistently known simply as the Doctor, each regeneration is commonly identified by number as well. The Classic Era of the show featured the First through the Eighth Doctors (again, check out our previous Doctor Who primer for more on that), while NuWho features Doctors Nine through Thirteen and beyond. While the Doctor always maintains core qualities of curiosity, compassion, overconfidence, and a mischievous desire to break the rules, each regeneration has their own unique personality, which gives the show a chance to refresh itself every few years. Doctor Who also gets a softer reset each time it introduces a new companion—the human friends and allies the Doctor temporarily adopts as his traveling cohorts. 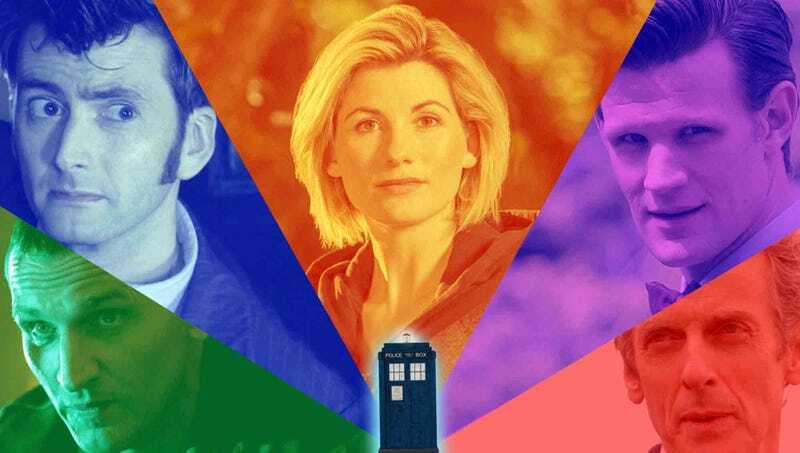 The introduction of a new Doctor or companion generally means a reintroduction to the basic tenets of the Doctor Who universe as well, which make those easy places for new fans to jump aboard. There are certainly plenty of long-term character arcs and ongoing mysteries to reward those who watch all of NuWho in order, and this guide will highlight four potential starting points for new viewers who want to get a fuller experience. But more so than most modern genre TV shows, Doctor Who is an incredibly episodic series. Each episode (or occasional two-parter) features the Doctor and his companion facing off against a sci-fi threat-of-the-week—sometimes in Earth’s past, sometimes in its present, and sometimes in far-flung intergalactic locations. In addition to hopping around in time and space, Doctor Who also regularly hops between genres. It can be a historical comedy one week and a contemporary horror the next; a twisty Twilight Zone-esque sci-fi mystery and then an exhilarating action adventure. So don’t be afraid to just pick an episode that sounds intriguing and start there; for many people that’s the best way to get hooked on Doctor Who. However, there’s one really important thing to note for those who are trying to watch all of NuWho in order: Doctor Who features special episodes that air between seasons—most notably, a new Christmas special every year. While some of these are unimportant one-off adventures, others are actually super crucial to the show’s mythology—many even introduce brand new Doctors and companions. Frustratingly, however, these specials are often packaged separately from the main seasons, both when you’re purchasing physical media and even sometimes when they’re streaming. That means it’s definitely worth referencing a full list of the show’s episode order as you’re watching (Wikipedia has a good one) to make sure you aren’t missing any important specials as Amazon Prime auto rolls from one season to another while skipping the connective tissue in between. The most natural starting point for getting into NuWho is simply to start at the beginning. Sixteen years after the Classic Series went off the air, new showrunner Russell T Davies (sometimes referred to by fans as “RTD”) rebooted the series with a brand new audience in mind. The Ninth Doctor (Christopher Eccleston) is still the same Time Lord from the original series, but a devastating off-screen event known as the “Time War” has wiped most of the other elements from the Classic Era off the board—including Gallifrey and the Doctor’s fellow Time Lords. You don’t need to know a single thing about Doctor Who before watching the premiere episode, “Rose.” Davies roots the season largely from the point of view of the premiere’s titular character and NuWho’s first companion, Rose Tyler (Billie Piper). A young working class shop assistant living in London with her mom, Rose serves as an audience surrogate to the wild, unwieldy world of the Doctor. World-weary, battle scarred, and well aware that he’s the last of his kind, the Ninth Doctor is stoic and brooding but still empathetic and impish. The first season explores the way Rose helps him process his trauma and rediscover his compassion, while he, in turn, drastically expands her understanding of the universe. Because of Eccleston’s abrupt decision to leave the show, the first season stands as somewhat of an oddity in NuWho history, but it also has a ton of great stuff to offer in terms of establishing the modern show’s characters, world, and overarching themes. The biggest hindrance to getting into this season is that the production values are really low. That’s a problem throughout the Davies era, but it’s especially apparent in this first season and especially in the premiere. The show also struggles to balance comedy and drama (another hallmark of the Davies era). But the first season beautifully showcases Davies’ skills at crafting complex emotional arcs and quickly fleshing out one-off characters, particularly in strong episodes like “Dalek,” “Father’s Day,” and “The Empty Child”/“The Doctor Dances.” The Ninth Doctor made his final appearance in the first season finale “Bad Wolf”/”The Parting Of The Ways,” which is when NuWho fans got their first taste of regeneration. Doctor Who exploded in popularity under the tenure of the Tenth Doctor (David Tennant), who debuted in the 2005 Christmas special “The Christmas Invasion” and stuck around for much longer than Eccleston. Confident, cheeky, and charming, Ten is a much more conventional leading man than Nine ever was, and he presents a far more personable face to the world. But Tennant also layers tons of complex emotional nuances just beneath the surface. The Tenth Doctor’s dashing act covers up a whole lot of pain and anger—some of it about the Time War, but much of it about the trauma and tragedy he experiences in this incarnation. It took a little bit for Tennant to settle into the role, and the exuberant Tenth Doctor of season two is a bit more of an outlier. Ten would later be far more defined by misfortune, self-pity, and guilt. By the end of his era, he was portrayed as a lonely god burdened by his own power. Ten traveled with a different companion during each season of his tenure, which gives this era of the show a palpable sense of forward momentum and an ever-expanding roster of characters. Rose Tyler sticks around for season two to guide the audience through NuWho’s first regeneration. Rose’s departure in the second season finale “Army Of Ghosts”/“Doomsday” marked a major shift for the series, one that placed the show more firmly in the Doctor’s point of view. In the show’s third season, the Tenth Doctor travels with perceptive medical student Martha Jones (Freema Agyeman), the first major companion of color in Doctor Who. In season four, Ten is joined by no-nonsense Donna Noble (Catherine Tate), who received mixed reviews as a one-off companion in the 2006 Christmas special “The Runaway Bride” but emerged as a more beloved character in the season four opener “Partners In Crime.” While the Classic Series tended to utilize companions as assistants to the Doctor and/or exposition devices, Davies established a NuWho template that positioned companions as true co-leads of the series and three-dimensional characters in their own right. Davies gives each of his primary companions a home life back on Earth and regularly features their families as major players. The excellent second season episode “School Reunion” even brings back Classic Who companion Sarah Jane Smith (Elisabeth Sladen) to explore what life is like for those the Doctor eventually leaves behind. During his tenure as showrunner, Davies continued to drastically expand NuWho’s world, particularly in explosive season finales that tended to bite off more than they could chew. In addition to creating new alien threats, Davies also slowly reintroduced iconic enemies from the Classic Series, including the genocidal pepper-pot-shaped Daleks, the emotionless Cybermen, and the Doctor’s Time Lord archenemy The Master. The Tenth Doctor’s era is an uneven one marked by incredible highs, but also incredible lows. The fourth season is the strongest and the third season is the weakest, with the second landing somewhere in the middle. But there are all-time great episodes within each season, all anchored by characteristically fantastic performances from Tennant and his various co-stars. Standout episodes of this era include “The Impossible Planet”/“The Satan Pit,” “Human Nature”/“The Family Of Blood,” “Midnight,” and “The Waters Of Mars.” After propelling the show to new heights, Tennant and Davies eventually decided to make a joint exit in the 2009 Christmas/New Years two-parter “The End Of Time.” Characteristic of the RTD era, it’s an overstuffed finale with messy plotting but some beautifully rendered, heartbreaking character moments. If you’re looking to catch-up on a good chunk of NuWho without committing to the whole thing, this is absolutely the place to start. After penning some of the show’s all-time best episodes during the Davies era, writer Steven Moffat was a natural fit to take over as showrunner. Moffat’s era is categorized by massively improved production values, a much better handle on comedy, and creative sci-fi storytelling that takes great advantage of the show’s time travel premise. Moffat’s characters aren’t as consistently written as Davies’ were, but his hugely creative worldbuilding usually makes up for it. Beginning with the fifth season premiere “The Eleventh Hour,” Moffat largely wipes the show’s slate clean to tell the far more whimsical story of the Eleventh Doctor (Matt Smith). Where Ten was a dashing but ultimately fairly human Doctor, Eleven is a decidedly alien one. A young man dressed up like an old professor (at just 26, Smith was the youngest actor to ever take on the role), Eleven finds pretty much the entire concept of humanity baffling. He’s clumsy, quirky, and prone to inadvertently sending mixed signals to pretty much everyone around him. Unlike Tennant, who started off a bit weaker and grew into the role, Smith absolutely knocks it out of the park in his first season, but can never quite recapture that same magic again. Though both Moffat and Smith would stick around for a long time, their tenure was never better than in the show’s fifth season—the single best season of NuWho so far. After a time travel mishaps embeds him deep in her timeline, Eleven is joined in his TARDIS by spirited Amy Pond (Karen Gillan) and later her mild-mannered fiancé Rory Williams (Arthur Darvill). The season balances episodic adventure and season-long storytelling with effortless finesse and features great episodes like “Amy’s Choice,” “Vincent And The Doctor,” and the stellar two-part season finale “The Pandorica Opens”/“The Big Bang.” This is also the time when the show exploded in international popularity, even more so than during the David Tennant era. Unlike the Davies era, which featured a lot of turnover, Moffat tended to keep his TARDIS team intact for much longer periods of time. Amy and Rory stuck around for two and a half seasons, to somewhat diminishing results. Season six is where Moffat’s writerly ticks started to become more apparent, especially when it came to his messily written female characters. (He was showrunning Sherlock at the same time and many of the same issues were apparent there as well.) Yet through those ups and downs, Amy and Rory remain one of Doctor Who’s best love stories and the Eleven/Amy/Rory trio is one of the show’s best TARDIS teams. Strong episodes from this era include “The Doctor’s Wife,” “The Girl Who Waited,” and “The God Complex.” When the Ponds finally did depart in the seventh season episode “The Angels Take Manhattan,” it was a massive shift for the series. The Eleventh Doctor’s era finally got some new blood with the mid-season introduction of new companion Clara Oswald (Jenna Coleman)—a plucky nanny who’s presented as a puzzle box for the Doctor to solve. During this time, Moffat began to push his love of twee whimsy almost to the breaking point (particularly with the Eleventh Doctor himself), and Moffat’s inconsistent characterizations also became more apparent. Clara’s arc started off strong in episodes like “The Snowmen,” “Cold War,” and “Hide,” but got a bit derailed as the show turned its attention to some high-profile 2013 specials. Moffat’s love of big, bombastic storytelling and massive mythology building was well-utilized in the show’s 50th anniversary special “The Day Of The Doctor,” but pushed past its breaking point in the Eleventh Doctor’s send-off “The Time Of The Doctor”—both of which touch on the idea of Gallifrey permanently returning to the series. If Doctor Who had arguably gone a bit off the rails toward the end of the Eleventh Doctor’s tenure, season eight saw the show consciously strike out in a new direction. The Twelfth Doctor (Peter Capaldi) was billed as a “back to basics” version of the character that stripped away the many, many eccentricities of his two previous incarnations. In practice, however, the Twelfth Doctor just winds up coming across as weirdly mean during his debut season. Though his blunt demeanor occasionally calls to mind the Ninth Doctor, Twelve is far more acerbic and often actively rude. Like Tennant, it took Capaldi time to settle into the role and find the right tone for his Doctor. He finally locked into his performance in the excellent 2014 Christmas special “Last Christmas,” which saw the Twelfth Doctor become a kind of punk rock professorial figure—which is what he remains for the rest of his tenure. (The Twelfth Doctor later trades in his sonic screwdriver for a pair of sonic sunglasses, which is a gag that works better than it has any right to.) Capaldi gets better and better each year he’s in the role. As Steven Moffat did when he took over, it looks like new Doctor Who showrunner Chris Chibnall is planning to start his era with a clean slate. The Doctor will once again be the only major character to carry over (at least for now), and Chibnall has said there’s “no barrier to entry” to the story of the Thirteenth Doctor (Jodie Whittaker). In fact, Chibnall specifically wants this season to serve as a “recruiting year” for the next generation of fans. So if you’re curious about Doctor Who or intrigued by the idea of a female Doctor, definitely feel free to dive right in! As the first woman to play the Doctor, Whittaker will bring Doctor Who into a new, unprecedented era. Thankfully, Moffat’s tenure also did a lot of legwork to normalize that idea that Time Lords can change both gender and race without much fuss. Like Moffat, Chibnall already had some experience writing for Doctor Who before taking over as showrunner. His previous credits include the third season episode “42,” the fifth season two-parter “The Hungry Earth”/“Cold Blood,” and the strong seventh season episodes “Dinosaurs On A Spaceship” and “The Power Of Three.” The even more impressive credit to Chibnall’s name is Broadchurch, the addictive British murder mystery series he created and wrote for three seasons. The series starred not only former Doctor David Tennant but also new Doctor Jodie Whittaker as well. Her excellent performance on that series coupled with her turn in the sci-fi cult classic film Attack The Block gives her a strong pedigree heading into the new season. As has been the case at various points in Doctor Who history, the Thirteenth Doctor will have a bigger TARDIS team. She’s set to be joined by new companions Graham O’Brien (Bradley Walsh), Ryan Sinclair (Tosin Cole), and Yasmin Khan (Mandip Gill). In addition to various novelizations and a whole world of Big Finish audio stories, there have been three modern Doctor Who spin-off TV series: The adult-aimed Torchwood, the kids’ series The Sarah Jane Adventures, and the teen-centric Class. All have their own unique strengths, but none are crucial to following the main series. Here are four episodes and a 50th anniversary special that represent a best-of outing for each NuWho Doctor, but which also function well for brand new viewers. 5. The 50th Anniversary Special—“The Day Of The Doctor”: Not many ongoing shows get to celebrate their 50th anniversary, so when it got the chance to do so, Doctor Who pulled out all the stops. Like previous anniversary specials from the Classic Era, this 2013 special is a multi-Doctor story featuring Eleven, Ten, and a previously unknown regeneration known as the War Doctor (John Hurt). Appearances from Billie Piper and Fourth Doctor actor Tom Baker add even more gravitas to this game-changing celebration of Doctor Who’s past, present, and future.